So here is a question. Which are you? 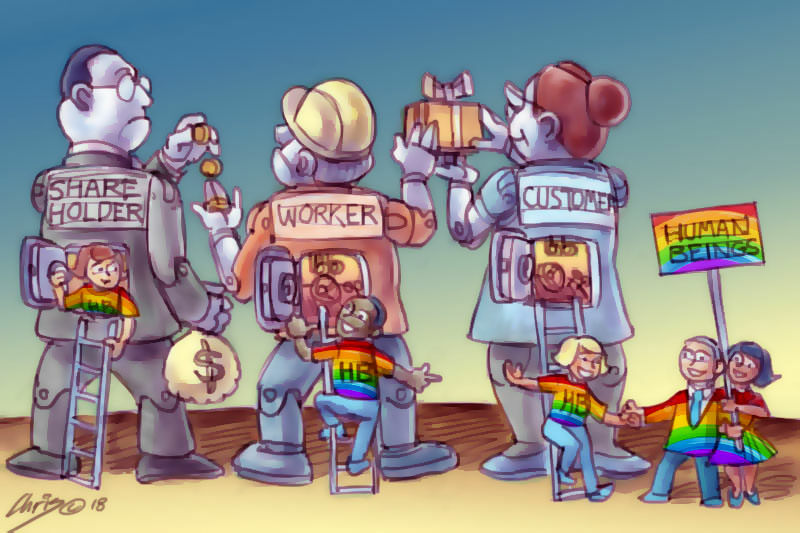 A customer, a shareholder, a worker, a citizen, or, well, a whole human being? If you answered 'customer' then congratulations, you are in line with contemporary economic orthodoxy — often described as 'neoliberalism' — and boy, have we got a society for you. The pro-market ideology that has shaped most policy making of the last five decades has been predicated on the idea that anything that impedes customer value is a blow against the entire economy, not to mention the natural order of things. For instance, the arguments for a free trade system — which, before President Trump's recent dramatic about face, has dominated policy making — are couched as incontestably superior because it benefited consumers and obeyed market forces. If you answered 'shareholder', then I am afraid we are obliged to bow down in adoration. In the contemporary value system, shareholders are the only people who come higher than customers because capital must at all costs be protected and provided with a satisfactory return on investment. Thus, as the Banking Royal Commission has revealed, it is perfectly acceptable to exploit customers, even dead ones, because shareholders must always come first. It is what is called in management circles 'agency theory'. The company's management are agents of the shareholders and must serve their interests at all times. If you answered 'worker' then I am afraid you are a big problem. Workers are a burden on both customers and shareholders because they expect to be paid a wage. This at once raises the price of the product to the customers, and reduces the profits available to the shareholders. Neither is acceptable, which is why companies have felt the need to look for workers in parts of the world where they can be paid very much less. This is perfectly alright, because it benefits both customers and shareholders. Some have alleged that there might be a relationship between what workers get paid and how much money they have to buy the company's products. They even cite the policy of Henry Ford, who deliberately paid his workers a good wage so they could afford to buy his cars. "Human beings have often been known to get in the way of 'market forces' especially when they do not confine themselves to being just consumers or shareholders." But that was then and this is now. Things are ever so much more complicated when there is potentially a global talent pool from which to choose and struggling workers in developed economies can always borrow at unsustainable levels to buy the products and work at three or four jobs just to meet the interest payments. If you answered 'citizen', then we don't really know what you mean. When Margaret Thatcher ingeniously said there is no such thing as society, she was really saying that there are no such things as citizens. How do we know that? Because no money changes hands. When someone does their civic duty, for instance, that may or may not be a thing, but we don't care because there is no transaction involved. And because we know that transactions are real, and everything else is not, then it irresistibly follows that there is no such thing as a citizen. If you answered 'a human being' then that really is a problem, I'm afraid. Human beings have often been known to get in the way of 'market forces' especially when they do not confine themselves to being just consumers or shareholders. Despite attempts to neutralise them by turning them into 'human resources' (inert substances that can be acted upon rather than act), they continue to do things like behave perversely, think for themselves, want more from life than just a higher net worth and various other activities that are so perplexing they cannot be included in the market system. It is to be hoped that they disappear off the face of the earth soonish. If the foregoing sounds a bit ridiculous (it is certainly meant to), it is largely how economic policy is being formulated in developed economies, including in Australia. Rather than using the whole person as the basis for thinking about how to develop and improve society, the focus has been mainly on markets, and those who operate in them. That markets are a human, artificial creation — and the money that changes hands in them is just a tool — does not seem to trouble policy makers. The situation is not just ridiculous; it is pernicious. A decent working definition of social ills is that any system that does not put the human being at its centre will become progressively more evil. The dynamic could be seen, in especially savage form, in communism's historical determinism, whereby humans were subordinated to dialectical historical forces. It can be seen in the obsession with market forces that is increasingly plaguing developed economies. The solution is to start with human beings and only then to reason how best to shape society. That is, to stop putting the cart before the horse. Any other approach will inevitably result in some form of wickedness. Which am I? Let's see. I go shopping so I'm a customer. I bought into the 'mum & dad' Telstra shares lure, so I'm a shareholder. I've seen 'Citizen Kane' and I am obliged to vote so I am a citizen. It's the whole human being that I'm not sure of. Sometimes I feel I am close to it though.